What is the voltage drop? What influences the magnitude of voltage drop? 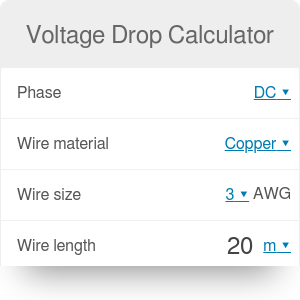 Voltage drop calculator is a simple tool that helps you determine what part of voltage is lost when the electric current moves through a wire, as well as calculate the voltage output at the end of the cable. Alternatively, you can use it as a wire size calculator to decide which wire diameter will ensure that your voltage drop doesn't exceed acceptable levels. If you still wonder how to calculate the voltage drop, look no further - simply keep reading to find out! This article will provide you with a voltage drop formula and a clear example of its application. Make sure to check out the Ohm's law calculator, too! By definition, the voltage drop is the reduction in the voltage, occurring when the electric current moves through passive elements of the circuit. Let's consider a wire that connects a house to the local electricity supplier. At ideal conditions, electrical current flows unobstructed along the wire until it reaches the house. There, it is used to power up multiple devices. In reality, though, the current is obstructed by some kind of opposing pressure. It means that some part of the voltage is lost when the current has to overcome this resistance. This loss is called voltage drop. If you have troubles with understanding it, you can imagine a person running along a straight path. If the path is clear, without any obstacles, and with appropriate pavement, the person will move fast and steady. On the other hand, if the road is difficult to run along, and there are stones blocking the way, it is more likely that the person will lose a lot of her energy just trying to overcome all obstacles. Wire material. The application of better conductors will result in a lower voltage drop. For example, copper is a much better conductor than carbon steel; if you will analyze the same current flowing through two identical wires, one made of copper and one made of steel, you will discover that the voltage drop is higher in the steel one. Wire size. The cross-sectional area of the wire has a large influence on the voltage drop. The thinner the wire, the higher the voltage drop will be. Wire length. Intuitively, a longer wire means a longer way for the current to travel, and hence higher voltage losses. You should always try to minimize the length of a wire. Load current. The higher the current, the higher the voltage drop. You should also double-check whether your wires or components such as LEDs can withstand a large current. The formula for voltage drop depends on the type of the current. n is the number of conductors in parallel. Begin with choosing your wire. Decide on its size, material, and length. Let's assume that you chose a copper 8 AWG wire that is 300 feet long. Decide on the current - the magnitude and phases. Let's say you chose a 1.2 A, DC current. Choose the initial voltage - for example, 220 V.
Input all of the values to the formula above the find the voltage drop - remember about the proper units! You can also input all of these values directly to our voltage drop calculator to receive the result of a drop equal to 0.451 V.
You can also calculate the voltage drop as a percentage. All you have to do it divide the voltage drop by the initial voltage: 0.451 V / 220 V = 0.205%. The voltage at the output is equal to the voltage drop subtracted from the initial voltage: 220 V - 0.451 V = 219.55 V.
As a rule, the voltage drop should never exceed 3% of the initial voltage. A higher drop may result in flickering of lights, as well as to overheating of devices (they will need to work harder than normal to produce the same effect). If you are interested in electricity, make sure to take a look at our series resistor calculator as well! Voltage Drop Calculator can be embedded on your website to enrich the content you wrote and make it easier for your visitors to understand your message.